I'm sad that Horny The Wing-Knight didn't get a name. And unceremoniously killing off the entirety of Velocitron and Eukaris is disappointing, even if I knew that all the colonies were going to get munched, in the same way that Thanos was inevitably going to assemble the Infinity Gauntlet. Still, though, pretty good as an action prologue! Let the merry-go-round of event deaths begin! So the first one really caught me off-guard. I see the bodies from Velocitron, and I see Cybertron Override, Energon Hot Shot, and someone who looks like Cliffjumper. And I think, "Weird. What toy from the Unicron Trilogy looks like Cliffjumper and could be on Velocitron?" 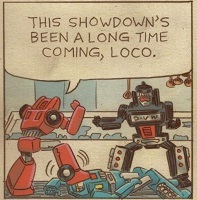 And the next panel is, "That's...Cliffjumper". I was expecting a generic easter egg and it turns out to be a real death. That was rough. Caminus's Strafe is looking oddly vehicular again. I don't know if that's a spoiler for The Falling or an art error. Elonia's metal is officially confirmed to be Ore-12, and the devastated body of Emissary is uncovered. And although the Titan is still alive, he is murdered by Arcee in order to stop a counter-signal from his Space Bridge that was preventing Wheeljack from teleporting the population of Elonia to safety. Gods are dying. And then comes Wheeljack. Criminally underused since his return in RID #33, Wheeljack sacrifices his life to hold together the Bridge and save 2/3rds of Elonia's population. His last thoughts were of Ironhide. LV-117 continues to be weird. The destruction of the planet seen in RID #10 apparently happened last week, although the effects and ramifications have been rippling through the universe for years. The dead worlds of Prion and Gorlam Prime were also consumed. How one manages to consume a planet that already collapsed into another universe, I dunno. Velocitron is gone and Eukaris is going with it. Windblade confirms that Cybertron intercepted the transmission in First Strike #6 that said "Welcome. Death." A second signal (confirmed in the back materials to be from TFvV #5) sent out a single word..."Unicron." You were criminally underused in IDW. Hell only Mcarty used him and we all would like to forget that era. Is this available digitally anywhere? It will be eventually, but likely not until early June. Have we seen the Ark-Zero before? I suppose I shouldn't be too mad about shock deaths in an apocalyptic end of the universe story. But I will anyway. Boo Wheeljack. Honestly, I liked Wheeljack's death. It was meaningful to who he was as a character, nicely heroic, someone he's got a lot of history with was there, and it was under the writer who's had primary custody of him for the last six years. It got me tearing up a bit, which I take as a sign it was well-executed! So the Spaceknights flew into Unicron's mouth while he was eating, saw some crushed tatters of Velocitron in his, uhh, cheek-pouches or something, and then Unicron... spit them back out onto Elonia? Or allowed them to fly out of his mouth, despite his gravity beam sucking a whole planet inwards? The Knights split up, as seen on page 4, panel 3. Rom and Livia flew over the surface of Unicron's body and saw the Velocitron remnants (which are there because, as explained later in the issue, Unicron is building up his body from the worlds he eats), whilst the others flew up to his mouth and got obliterated. Rom and Livia seemed to get caught in a shockwave from that and knocked down to the planet's surface. Edited by Jalaguy, 05 May 2018 - 01:26 PM. I wonder what he was going to say to Ironhide. It read very much like it was meant to be "I love you", but, like, Ironhide and Wheeljack haven't really interacted much at all. Unicron the world destroyer is here. And here we go with fatalities. Damn. Emissary is gone as soon as he was unearthed. What a shame, if it does highlight the crisis level posed by Unicron. And so passes Wheeljack. You will be missed. A second signal saying Unicron was sent out during the events of Transformers vs. Visionaries, eh? Well that could have been set up better. So Prowl the owl has appeared as a Chimeracon, a Maximal, and a Eukarian? Haha, I guess that attests to how beloved the character design is. And I wonder if its specifically Alex Milnes decision to repeat Energon Hot Shots cameo from MtMtE #35. Heh, Unicron Trilogy forever! It was "Tell Ironhide to..." rather than "Tell Ironhide I..."
Headcanon: "Tell Ironhide to delete my browser history." In part, I think what I like about their deaths, is that they weren't done to hurt Unicron, they weren't any big sacrifice for victory. They died because there wasn't enough time for anything else. Although it is a real pity we'll never get an Emissary with Emissary and Emissary titan. Have you seen a purple bard around here? I got to the last page... and now I have no interest in it at all. Eukaris being shown to be destroyed with no evacuation just makes windblade look like an idiot. The fact they weren't evacuating other colonies... Like I said, just stupidity all around. Optimus prime is not the only person who can evacuate a planet. Look, look... I'm going to be honest with you. 99 percent of everything I say and create is a reference. Also apparently I sound like Dusty Rhodes. I imagine there were, like with Cliffjumper's team on Velocitron. We just don't see it on that page. There may have just been levels of success, depending on how much warning they got.